Retro sunglasses are back in the shops. Sunglasses have been a fashion item since the 1920s. We thought it would be great to look at how styles have changed over the decades. If you want to get a great pair of retro shades, read our guide as to how people looked cool in the sun from the 30s to the 80s. People first wore sunglasses in the 20s and 30s, when being out in the sun first became fashionable. Sun glasses were essential and practical beach wear. Ever since then sunglasses have been a great way to put on the style. In the fifties, the original Ray Ban Aviators and Wayfarers gained cult status. They were revived again in the 80s. In the 70s, large lenses were in vogue and there was a fashion for Photochromatic lenses that changed colour according to the light. The 80s brought matt black frames and new designs. These days you can choose retro sunglasses to suit any mood or period style. The 20s and 30s were the first days of sunbathing. Sunglasses were literally made of glass. Round frames were in fashion and lenses were small, as is illustrated right. 20s and 30s sunglasses offered no UV protection. In those days it was thought that basking in UV rays was good for the health. Sun bathing in the South of France was the most stylish way of spending the summer in the 20s and 30s. People sunbathing in the UK would also have worn this type of shade too. Green shades were used in Ray Ban Aviators, which were developed in the 1930s by Bausch and Lomb, for use by the US Military. 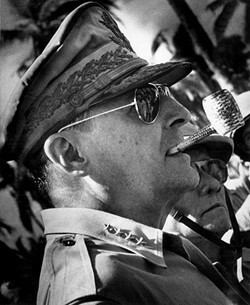 In 1945 General Douglas MacArthur (left) liberated the Philippines sporting a pair of Ray Ban Aviators. The cult status of the brand was sealed. On 22 July 1952, Rayman F E Stegman filed a patent for a new design of sunglasses for Bausch and Lomb. The patent was granted in 1953 and the Ray Ban Wayfarer was born. 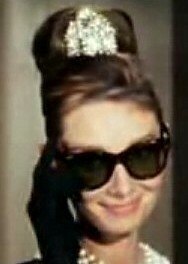 Audrey Hepburn made Ray Ban Wayfarers famous when she wore a pair in the 1961 film, Breakfast at Tiffany's. In the fifties and sixties, the rich and famous in America bought Ray Bans. The brand was less well known in the UK. James Dean and Marilyn Monroe were other celebrities also seen sporting Ray Bans Wayfarers during the 1950s. Around 10 million pairs of sunglasses were sold each year in the 60s. They cost from a few shillings a pair to nearly �10 for Zeiss glass lenses. Ray Bans sold for �4 10s 6d in 1968. Polarising lenses were common in the 60s. Edwin Land, founder of the Polaroid Corporation, first used polarising glass in sunglasses in 1936. The Polaroid brand was well known in the US and the UK. People may remember the strange pattern you could see in car windscreens when wearing Polaroid lenses. With the growth in foreign holidays, sunglasses grew in popularity in the 70s. Lenses were large. This pair of Polaroid's, right, is from the early 70s. The large, angular frames are typical of this period. Large lenses are enjoying a revival and 70s style retro sunglasses are hot these days. Photochromatic lenses, that changed colour according to the light, were popular in the 70s. Reactolite Rapide being the best known brand. In the 80s, sunglasses were cooler than ever. Everything went matt black. There was a wider than ever choice of styles. The sunglasses, left, are Samco by Mazzucchelli, a popular fashion brand. They show distinct 80s style detailing. There is a touch of geometrics and the pink and grey colour combination was very fashionable in the 80s. Ray Ban Aviators and Wayfarers returned to popularity and became the sunglasses to own. There were numerous copies available. This pair, left, are an Italian copy from the late 80s. "PLease help! I'm looking for a pair of authentic looking 1930s sunglasses (like image above) does anyone know where I might be able to purchase some? No luck on amazon or ebay..